I don’t know about you all, but I am a big fan of chickpeas, and when I saw a recipe in the Moosewood Restaurant Celebrates cookbook for Spanish chickpeas with saffron and paprika, I was sold. This stew is adapted from the Moosewood recipe. Other than cooking the beans (if you don’t use canned), this is a pretty quick recipe and very low in fat. It’s a little spicy, so I offer some variations if you want to tone down the spice. 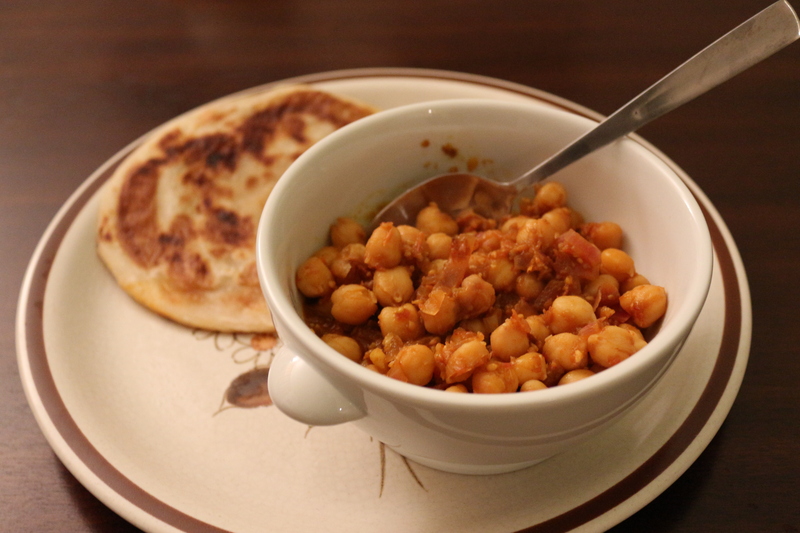 I served this with Trader Joe’s paratha and some other frozen Indian naan-like breads. It’s also great with a hearty bread dipped into the sauce. 1. 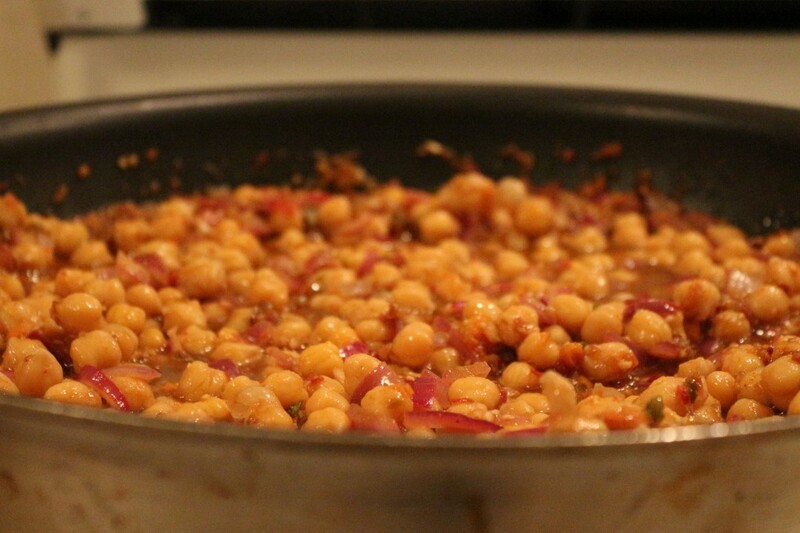 Garbanzos: If you want to do canned garbanzos, that totally works. Just drain and rinse and move to the next step. 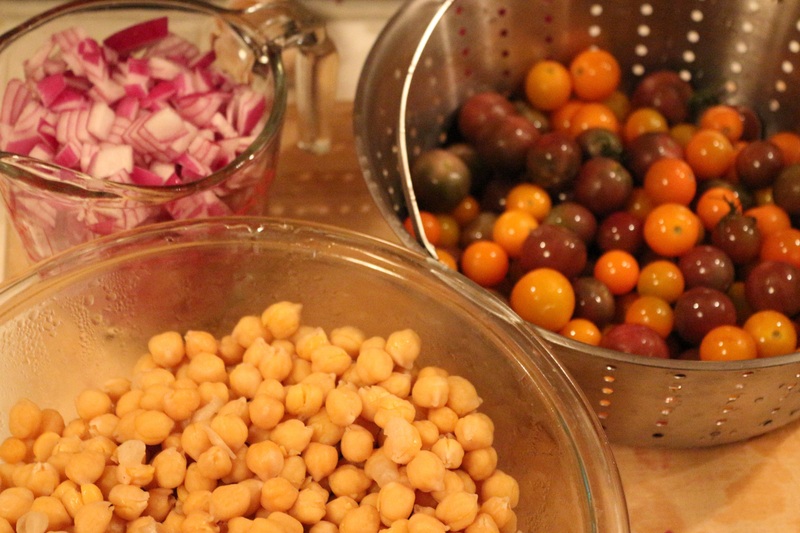 If you want to make your own garbanzos, start with about 1.5 to 2 cups dry garbanzos. Rinse and take out any weird looking ones. Follow the directions on the package for soaking and cooking. However, when cooking, add in the salt, paprika, saffron and garlic cloves listed at the very top of the ingredients list. That will give your beans some flavor. The nice thing about making your own garbanzos is that you can make them as salty – or not – as you want, and can also cook them as firmly or as mushy as you like. 2. Making the stew: Heat olive oil in a large non-stick pan and add the chopped onion. Cook over medium heat for about 10 minutes. 3. In the meantime, add the rest of the ingredients to a food processor (tomatoes, soy sauce, adobo sauce, garlic, paprika, saffron, lemon juice, salt, and agave/sugar). 4. When the onions have softened (about 10 minutes), add the tomato sauce mixture and the garbanzo beans to the pan. Stir well to combine. Simmer the whole mixture for about 10-20 minutes. 5. Enjoy! I mixed some goat cheese and feta cheese into my stew to add a little creaminess and tang. But this can be eaten as is. This entry was posted in Mains, Sides, Soups and tagged Beans, Gluten Free, Lemons, SPICY, Tomatoes, Vegan, Vegetarian. Bookmark the permalink.